This was one ghost hunt which I have been looking forward to for some time, because I held a ghost hunt here many years ago and knew of the potential so I was very keen to explore this venue further. We were not disappointed. I decided to hold all my sessions in the coldest part of the building, the tower. These two rooms also had many “extras” namely deceased animals of some kind which always puts people’s mind at rest! After forming a séance circle in one of the more interesting rooms I asked the spirit to step forward and we were immediately joined by Maxwell (Max) an RAF Officer from the Second World War who was stationed at St Augustine’s during the war years. Max was a square build, aged in his late 40s or early 50s, about 5’11” in height, short brown curly hair, and he wore a moustache and talked exactly how you would expect an officer in the RAF to sound. After asking Max to move people in any way he could, he started moving my arms which quickly progressed to moving other people’s arms including Jeff (guest) who rarely feels any movement at our ghost hunts, much to Jeff’s surprise. Various people had their arms moved, chests and stomachs prodded and arms stroked. I then asked if he could push people, which started quickly as well and he was able to push and pull guests and sway them as well as lift their arms above their heads, so much so that some people were standing on their tip toes to reach. We were also pulled downwards by our hands to the floor but this was mostly the people either side of me. Whilst all this was going on I was aware of another spirit who was standing in the doorway, he was about 17 or 18 years old and from a much earlier period of time but he didn’t really tell me much about himself, just kept laughing at all the strange positions we were pulled into. After we finished this séance we went upstairs, this is the loft room which has roof beams which are about 5’ from the floor so the majority of people had to duck to walk between them. Standing here many people felt that they were being pushed and swayed. We were not holding hands which each other, just standing alone in the dark, this made the sensation even more scary because there was nothing anyone could see, it was pitch black darkness. The spirit that was responsible for this was called Brian, he was a gardener of the house during the 1950s, who had a long black well trimmed beard and he delighted in himself that he could push and sway people. After a short break the second group of people joined me in the tower, once again I started the séance in the first two rooms and Max joined us again. He never actually left. This time the movements were much gentler and slower as the people present were too busy talking about other things and not encouraging him to do anything to them. However I was still being moved and the two people either side of me were being manipulated and dragged downwards to the floor. Max seemed obsessed with some of the footwear that the guests were wearing and used my hands to touch and stroke each person’s shoe. During one part of the session I and the people beside me had our hands pulled across the circle and when a guest asked not to be touched I thought I heard a voice say “Sorry”, but no-one else heard this sound and no-one said that they said anything. However because this session wasn’t recorded on video I cannot check to see if this was made by anyone in the room or whether it was a spirit voice. From here we moved up to attic room and similar sensations were felt by these guests that the first group encountered. However one guest felt very emotional and could sense a female energy, I too saw the female spirit but could not hear what she was saying. This particular guest was crying because of what the female energy was saying and doing. The female energy was crying and saddened by some children. She kept repeating the phrase “what about the children, the poor children”. What this referred to is a mystery but hopefully this information will come to light in the coming weeks. (We have researchers who are looking for more historical information about the Priory, especially from the war years because this information will be freely available shortly). The third group to the tower rooms have been on several of our ghost hunts and call themselves “The Boo Club” and are very open to spirit which made Max happy as he was very quickly able to move people and our arms and push people against other people and drag others across the room. This was the only session of mine which was recorded on video and Carl (GHE team) who was recording the video had to constantly move because every time he had a good view of what was going on people were being moved and twisted so that Carl didn’t have a good view. The shorter members of the group were lifted by their arms and then suddenly Max decided that he could twist people into very uncomfortable positions. We were moved, twisted, swayed and rocked into extremely painful positions and people who were on the opposite side of the circle to me were somehow now beside me. When Max had finished moving us which took about 5 minutes. It then took us another 10 minutes to figure out how we could untangle ourselves without letting our hands go. Max found this absolutely hilarious as we could not figure out how some people had ended up where they stood and how our hands had become so entwined. After all this exercise we went upstairs to the loft room and after seeing some of the Second World War graffiti and some of the more modern 1970s graffiti we stood in complete darkness without holding hands. However the same male spirit was present but didn’t move or sway people like he did with the other groups, but many people felt the floor vibrate. I then decided to tap lightly on one of the beams and asked for Brian to repeat the sound, instantly we heard a similar knocking sound although everyone heard it, we all thought it came from different directions. Tapping several other times, the whole sound (i.e. 3 taps) were not heard, but we did hear a single tap in each response. It seemed the quieter I was able to tap on the beam the more likely Brian was able to copy or repeat the sound. Every time I tapped we all heard a response. As the session was proceeding the responses were getting better, but not louder which was a shame. Hopefully there will be a next time at this venue that we can explore this further. During the free time session I joined a group downstairs in part of the cellar/kitchen on a Ouija board. Although I don’t know who the spirit was, he was a recent passing as he uttered the word Zebedee whilst we were using a new addition to our kit, the Spring Ouija board. I also joined some guests upstairs in the same room as all the pushing had taken place and they were holding a séance, they also had a spirit box (a device that scans the FM radio frequencies in reverse at 100ms) running in the background. During their séance there were many voices including lots of laughing and people’s names (of their group) being called out. I was able to stand behind the group and ask for the spirit (who wasn’t Max, but all I know is that this spirit smoked a pipe as I could smell it) to push and manipulate people just by pointing at a person behind their backs or by pointing to the person above their heads. This worked extremely well and became very amusing for me because I was able to ask the spirit for something in my head so that no-one knew what was being asked for and a few minutes later the guests that I asked for this activity to happen to occurred. I also asked for the spirit to do something to everyone at the same time and I also didn’t say this out loud and some people started to move how I had asked and then the spirit made everyone move. I asked for all their hands to be lifted and joined in the centre of the circle and then when everyone was touching hands about shoulder height I asked for the rest of the manoeuvre which occurred very quickly much to the surprise of the guests. Their hands were all lifted above their heads. This is what I call the “Three Musketeers salute” and the guests sarcastically thanked me for this! From my perspective this was very funny as it is not often that I can get the spirit in the room to do what I ask when I am not part of the séance group. However this time this all worked perfectly. No EVP’s (Electronic Voice Phenomena a.k.a. ghost voices) were recorded throughout the night as it was either too windy or there were periods of rain which made at a lot of noise on the walls and roof. This would have drowned out any noise of a spirit talking. This was a very enjoyable ghost hunt with a venue that has lots of potential and one which we will hopefully be able to return to in 2014. Many of the guests had a very entertaining and some weird and strange paranormal activity happen to them. This is what I would call the first winter ghost hunt, cold and rather muddy, however this did not detract from the level of paranormal activity experienced by the guests. The first location we had some good but brief moments of KII activity and some communication via our electronic equipment, but the majority of the time we were hearing footfalls and other strange noises from within the woods. Given the nature of these woods it could not have been a person as they would have needed a torch to navigate, which we didn’t see. A female energy was present, although she did not tell me her name as she felt quite shy, however she was wearing a flowery dress and looked to be in her 30s. Also present was a male spirit called Timothy and during the resulting séance, some arm movement was felt by the guests. The second location, once again strange noises and footfalls were heard but still no obvious answer to the noise. I set up the laser grid but nothing was seen in this grid. Whilst we were looking into the grid I turned on my SB7 (Spirit Box) which scans the FM radio frequencies in reverse at 100ms intervals. As it is scanning in reverse we can be fairly sure any voices heard in normal time are from spirit because no radio station broadcasts in reverse. On the SB7 we heard “Hello” and the names of some of the guests “Laura” “Lisa” and my name “Steve” and strangely when asking questions out loud the spirit responsible didn’t just say yes, they said “I understand” or “Correct” which is rather odd. There were lots of word spoken although not all could be understood. Once again a very enjoyable ghost hunt and one in which the guests had a number of paranormal occurrences or experiences that they could not explain, not to mention the very good session with the Spirit Box. We have held two ghost hunts at Rye Castle in the past and each time the level of activity increases nothing could have prepared us for what happened on 21st July. It was truly exceptional what the guests experienced. We started with two groups, one group going up to the upper level, the other to the basement level. My group on the upper level had within minutes much KII activity and plenty of communication via our electronic devices and since it was still relatively light outside the room felt safe and generally comfortable. To give the guests an experience of the spirits that reside within the wall of the Tower I decided that it would be pertinent to hold a séance, as this is the best way to experience spiritual activity. We were joined by a male energy called Tony, he was aged in his mid-40s and quite a stocky build since he was about 5’8” in height. He was wearing a white shirt and brown or tan trousers but what struck me as being odd is that he had very shiny black shoes. The shoes did not look like they belonged to him. Tony was a happy spirit and I felt he would have been quite a character when he was alive, as his facial expressions hid nothing. He had a round likeable face although slightly bald. He seemed to be have no reason to be in the tower. If he did he didn’t tell me. During the séance circle Tony moved the guests arms on request and did exactly what they asked, even when the guests did not voice their request. We were also joined by Agnes a female energy who remained non talkative from the start. She was well dressed and aged in her late 40s. Lorraine (guest) could smell sick during the séance which made her feel uncomfortable and then she could taste it as well which nearly made her physically sick! Ted (the Rye Castle Museum guide) could also smell manure as did some of the guests including Lorraine. Ted also smelt roses but only in a certain part of the room, Jeff (guest) too also smelled roses. There was also a Policeman or Peeler present. He only gave me his surname as Constable Peace. He looked about 30 years old but did not talk to me, just looked on for the entire séance, which not only involved gentle arm movement but also some swaying and for Rachael (guest) some much more forceful movement. During this time we could see light flashing through the floor which we assumed was the other group taking photographs, however light would not have reached us from where they were (in the basement) and when we asked them after the session had finished they did not take any photos on the ground floor, which had they done so we would have seen. The light we saw has no rational explanation as light cannot pass through solid objects. After a short break both groups swapped locations. Once again on the upper floor we had excellent communication via our electronic equipment but this time very little KII activity. The room also felt different and most people noticed this. Both Ted and I had no explanation for why this might be. Once again we were joined very quickly by a young energy. His name was Timothy Spratt, his father was a local fisherman and his mother was imprisoned in the Tower. He was about 9 or 10 years old and was dressed in what I would call a school uniform and had blonde hair. There were also two female energies present, possibly sisters as they looked alike, aged about 20 years old and they just stood by the display cabinets and some of the guests saw shadows in that area of the room. Ted commented to me that he felt uncomfortable in one of the corners beside a cell. I could feel the spirit energy that was responsible, although he posed no threat to us at this time even though he wasn’t a particularly nice person. Once again I started a séance circle so that these guests could experience spirit activity and hopefully get some physical movement. The movement started gently with simple arm movements to the majority of the guests. Many of the guests were amazed at this as they did not expect anything to happen! I noticed a male energy that seemed to appear from nowhere step really close to the circle, the other energies that were present all disappeared and the movement stopped briefly then started again but with more force. The male energy gave his name as Benjamin and he made Claire (guest) feel very uncomfortable. All Benjamin told me is that he was the energy that Ted felt in the room earlier and that he hated women and used to murder them for fun. He was imprisoned briefly in the Tower for murder. Benjamin tried to twist my hands and Shelly’s (guest) apart, as Shelly was standing next to Claire and Benjamin thought he could get to her that way. Many guests also felt very cold when Benjamin was standing near them, this felt like the sort of cold felt when opening a freezer. Teresa (guest) who was standing on my left felt movement around her ear and hair, several minutes later her earring “fell out”, which given the way earrings are attached could not have been an accident as everyone was holding hands and no one touched Teresa’s ear. The energy Benjamin was making many of the guests feel uncomfortable and we could all feel a force which was pushing us downwards. Ted had moved from where he was sitting because he too didn’t feel well sitting in that spot and moved to the other side of the room. Many guests felt sensations around the back of the necks and their hair, I too felt a restriction around my throat. Shelly also felt pains and touches in her sides. Then I saw my guide, this is something which I don’t often see, which is just as well because every time I do it means I or someone in the circle is in danger. Within a matter of seconds, after I had told the guests what I had seen I was just about to say “He’s Gone” when everyone in the room felt a huge relief and we were all able to stand upright. The atmosphere in the room changed from its thick nature when we started to a light an airy nature. The guests could not believe what they had just experienced, especially Teresa who was a sceptic. After another short break everyone headed out into the courtyard and Women’s Tower. In the top room we have experienced much activity before and as we started Carl (GHE team) stood in the corner of the room that he didn’t like and an area which many guests have felt odd or strange. Marc (GHE team) and myself were calling out for spirit to make a noise or to whistle. Carl heard some responses although he was wearing an audio amplification device, the rest of us did not hear those sounds. Once again some of the guests were feeling sick. I had warned them that this may happen, as it has every time we have visited the Women’s Tower. Marc using his Ovulus had the male energy Tony (from the earlier séance) telling us to go outside. Ted by this time wasn’t feeling well (again!) neither was Carl and both had to leave the room. Marc decided that it would probably be a good idea to hold a séance circle to build the energy and get the spirit energies to do something. After a short amount of time there were energies present and people were feeling strange and odd sensations. Marc then asked if they guests were OK, but Teresa failed to answer. Marc said that her could feel her “going” and I stepped in to place her in the middle of the circle as she did not respond to her name being called out. Once in the circle she came back straight away although she felt very tearful and insisted that she leave the room, so I escorted her outside, where she remained tearful and she explained that she felt the despair and the emotions of the spirit energies that were held there. This was undoubtedly the most interesting ghost hunt and the most activity felt by the guests that we have held at Rye Castle and I suspect that the reason for this is that we are not allowed to go back until 2013 because the Museum is having some major repair work on the roof of the Women’s Tower and the building will be closed for many months. All the guests and Ted thoroughly enjoyed the experience, as did we because the EVP’s that we recorded here are some of the clearest that we have recorded to date. 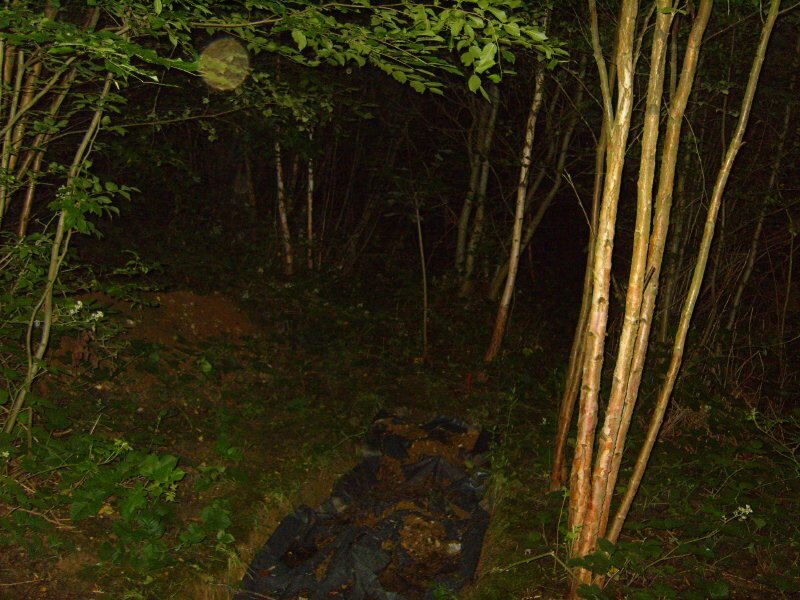 Wychling woods (Kent) is known for its weirdness, strange things happen here, every time we have been in the woods, odd and strange things have happened either to the guests one by one, or to the whole group en mass. We may have been tempting fate to be here on Friday 13th, but that only counts if you are superstitious! We aren’t. Our first session was in a familiar part of the woods, this area has in the past been very productive and many paranormal occurrences have taken place. This evening was no different. We started by just calling out for spirit to step forward, there was a high level of KII activity and plenty of communication from spirit via our communication device. Whilst this was going on one guest (who has been on various ghost hunts many times) jumped and exclaimed that he had just heard a footstep beside him, no-one else heard it. As we continued strange whistles were heard, sometimes in response to our whistles but many were not. Then out of the blue we all heard footsteps approaching from deeper in the woods, which given the nature of these woods (it is very thick with trees) it seemed very unlikely especially since we saw no torch light and the sound of these footsteps only lasted for about 30 seconds. From this point on many of the guests were feeling frightened and on edge and the smallest amount of noise made them all jumpy. All of the guests huddled, whereas I moved freely around them, not feeling at all scared and without a torch (as I have very good night vision). All of the guests said that they all felt spooked and that they had the feeling that something was about to happen, many guests also reported that they felt watched and all reported at different times the feeling of their jackets or legs being touched. We continued, and I started my SB7 (Spirit box) which is a device that scans radio waves at 100ms in reverse, so any voices we hear on this we can be sure that it is not being broadcast. Asking for the spirit energies present to use the device to say their name or any of the guests names. Within a few minutes we all heard two of the guests name spoken clearly via the device. This did not help any of the guests feel more relaxed and whilst very little happened of a paranormal nature all the guests were now standing back to back as they were all feeling on edge and all commented that they felt a sense of dread. As I moved closer to them I too could feel a slight feeling of being watched although not of the same intensity. After a few minutes all the guests exclaimed that this strange feeling just lifted and they all felt comfortable in the woods. What caused this feeling I could not tell. Our second session was on the other side of the woods in an area which has previously been another area of much paranormal activity, although since my last visit I had some problems locating it as the path had overgrown with weeds, after much stomping about I finally found the right area. Here we were met by a female energy called Elizabeth who was aged in her late 20s and she told me she was a Land Girl during the Second World War. Elizabeth also answered many questions via our communication devices although very little was audible on the SB7. KII activity however was very high. There was little photographic evidence from the night, apart from in this area where several light anomalies (spirit orbs) were photographed. Once again an unusual ghost hunt, but one where even the guests who had thought they had experienced everything on a ghost hunt felt like it was their first time ghost hunting. Ever since our first ghost hunt at the Red Lion Hotel back in January 2012, we as a team thoroughly look forward to visiting the Red Lion Hotel in Colchester and every time we go more activity and unexplainable episodes are experienced by us and our guests. So our expectations were high, but we were not disappointed. My designated area for the evening was the cellar, the first group of people were all new to ghost hunting, however spirit energies came forward to provide them with some evidence. We were first joined by a male energy called James, he was about 28 years old and of a slim build and a round face, he gave me the impression that he was a religious man and connected with the church. He gave the year as 1930. James started to use his energy to move us, by gently moving the guest’s arms. Lucy (guest) felt a very odd sensation in her arm, like pins and needles and goose bumps. Kristein (guest) also saw lights and shadows at the other end of the cellar. Carolanne (guest) said she felt child energies and had the desire to sign patriotic Vera Lynn songs from WWII. During this time I was being swayed left to right, which I didn’t notice until one of the guests mentioned it to me. When I was calling out for spirit to copy a whistle, some of the guests heard whistles whilst I was talking and one guest heard a whistle in repeat of what I asked for. Audible sound played an important role during the ghost hunt and after a beer barrel was tapped, everyone heard footsteps within the cellar. At one point we all heard a strange groaning sound which I thought came from our remote cameras, other guests however thought it came from outside. On inspection of the footage recorded from this session the groaning sounds more like it actually came from the remote camera than outside. There was also a female energy present, she was rather nervous and about 16 or 17 years old who had long ginger hair and wearing a very flowery summer dress. When I asked spirit to make someone smile, Lucy started to laugh out loud, which is exactly what I asked for in my head, as I felt the energies would be able to make people laugh for no real reason. A Second World War soldier was also present, his name was Matt but that is all the information he gave me. After we broke the séance circle, myself and Lucy found it quite difficult to let go as it felt that both of us were “stuck” together with an invisible force. During this session, many noises, footfalls and whistles were heard all within the cellar, the electronic equipment; K2 and Ion meters all registered high levels of activity. The second group to the cellar felt completely different to me, the energies that were here in the first session had moved on and a male energy by the name of Alfred came forward, he was local man, aged in his late 60s, with greying hair, quite a stocky build who wore a flat cap and was what I would call a typical granddad type. He told me that he tendered an allotment which was straight down the high street. One of the guests (who lived locally) confirmed that this information is correct. During the resulting séance, strange creaking sounds were heard by all, as if someone was walking on creaky floorboards, however there are no floorboards in this area. Many lights were seen by the guests as well as cold spots. Alfred did attempt to touch and move some of the guests, however not all guests felt his energy. As I explained to the guests that Alfred would not have touched women (the group was all female) in his physical life and therefore he took those values with him into his spiritual life. The third group to the cellar once gain had a completely different feeling and we were almost immediately joined by a First World War soldier, whose name was Captain Timothy West, standing about 5’11” wearing round spectacles and sporting a moustache. He was 22 or 23 years of age and carried a crop or stick and wore brown leather boots. Timothy happily started to move the arms of the guests, mainly backwards but would only push the male guests, forwards, backwards and from side to side. Many guests including myself had pains in our ankles which I attributed to Timothy as he was the only spirit energy present. Many of the guests felt cold spots however after about 30 minutes Timothy left us and the cellar felt completely flat. I then decided we would enter the cellar of the coffee shop since this area felt very active on my first visit to the Red Lion Hotel. Once everyone was seated comfortably in the coffee shop cellar, we all heard a sound that resembled someone crushing a plastic bag. Whilst in this area guests and myself were asking out for spirit to copy rapping sounds and some responses were heard by everyone. Our K2 meters detected lots of activity and during an EVP (Electronic Voice Phenomena – a.k.a. ghost voice) experiment the K2 meter registered highly after every question that was asked, however at the time we heard nothing audible. However on analyses of the recordings many voices were heard, the best examples can be heard below. Then we heard what sounded like someone rifling through a box of crisps, knocking the box over and running away. I sent Sean (cameraman) up to the coffee shop as I envisaged that someone had entered the coffee shop and was stealing the produce, I followed Sean and the both of us expected to see someone in the coffee shop, or at least the door open. However when we opened the door to the cellar, there was nothing out of place, nor any boxes knocked over, nor in fact any crisp packets within the establishment. One of my team members was outside at this time and on speaking to him he was stood outside for the last ten minutes and saw and heard nothing that could have been responsible for the sounds that we heard. In video footage for this instance the clarity of the sounds we heard is very audible and on watching this you can probably understand our reaction; that someone had broken into the shop. All of the guests felt the need to leave the cellar and follow us into the main coffee shop. From this point on we then had a 30 minute window where we allowed the guests a free roam of the hotel, many of these guests re-visited areas in which they felt the most activity or participated in an activity that they enjoyed the most. Three guests and Sean re-visited the cellar to the coffee shop to see whether the spirit energies could re-create the sounds that we heard moment earlier, however after 20 minutes they returned as nothing was heard. Once again a very successful ghost hunt at the Red Lion Hotel and an evening where all guests thoroughly enjoyed themselves and experienced all manners of the spiritual activity that the Red Lion Hotel can offer. It is an exceptionally spiritually active hotel and we as a team are looking forward to our next visit in August 2012 and subsequent visits later in the year. As a sub note, I usually do not sleep after a ghost hunt, as we have a lot of equipment to pack up after our ghost hunts, but this was the first time that I decided I would actually have some sleep (3.5 hours) and as I was lying in bed the bed seemed to jump or jolt, which I thought to be strange and just as I was about to fall asleep I heard a female energy whisper in my ear “Hello”, had I not been very tired I would have investigated this more, but I shall leave this until our return in August. My room was room 10, which is a known haunted room, allegedly the room of the resident ghost Alice Millar.